In the Catholic Church, marriage was elevated by Christ Himself, in His participation in the wedding at Cana (John 2:1-11), to be one of the seven sacraments. Being a sacrament, marriage expresses the unbreakable bond of love between Christ and His people. In a sacramental marriage, God’s love becomes present to the spouses in their union and also flows through them to their family and community. By their permanent, faithful giving to each other, the couple reveals something of God’s unconditional love. 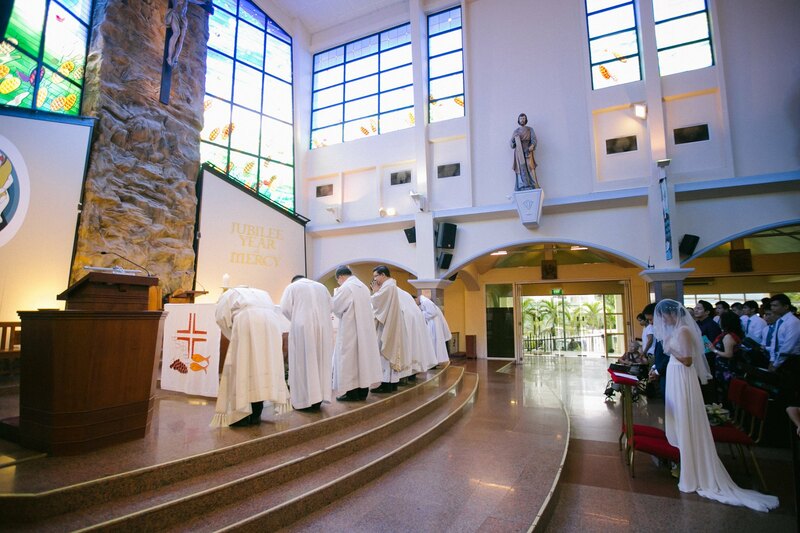 Sacraments bring grace to those who receive them with the proper disposition. In marriage, the grace of this sacrament brings to the spouses the help they need to be faithful and to be good parents. It also helps a couple to serve others beyond their immediate family and to bear witness to a loving and lasting marriage is both desirable and possible. The sacrament is not a social convention, an empty ritual or merely the outward sign of a commitment. It is a gift given for the sanctification and salvation of the spouses. Marriage is mission. Attend Marriage Preparation Course(MPC) or Engaged Encounter(EE) to learn about the fundamentals of what it means to have a Catholic wedding. It is also a good time to dialogue with your partner on your values and beliefs and how to move forward to marriage. Set aside time to plan for your wedding day flow and logistics, but do also set aside for spiritual preparation beyond the set programmes so that your engagement is meaningful. E.g. Block out 1 day a month to just spend time together talking about life and not worrying about your colour theme or door gifts. The priest will further guide you both in your marriage preparation and journey with you till he celebrates your wedding Mass in church. You can sign up for NFP courses or approach those familiar with the process. It is promoted by the Catholic church and is intended to unite the couple in the process of family planning. The form will be completed by the couple in the presence of the priest 1-3 months before the wedding. You will need an extract of your baptism certificates (do enquire at the parish you were baptised at), the certificate from MPC or EE, ROM certificate(if already solemnized). You need to file a notice between 3 month and 22 days before your wedding day. Do let the officer know that the solemnization will take place in a Catholic church, do hand the notification of marriage to the priest celebrating your wedding Mass or the parish secretary. The couple as well as the wedding planner(s) will be guided through on what to do during the ceremony. 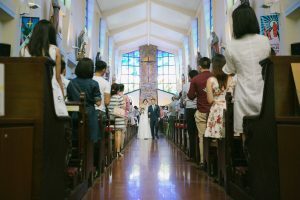 There are various other Catholic programs that help couples in various phases of their relationship such as Marriage Encounter (for couples who want to deepen their marriage) and Retrouvaille (for couples to heal and renew their marriages).